We often hear at marriages that “two become one”, and don’t fully understand the meaning. When you marry, your spirit is intertwined with your spouses. You share life together in such a way that you become like each other, finishing each other’s sentences, often dressing alike, and even saying the same things. God’s warning to Solomon came from His knowledge of what marrying those that are not Christians would do to his relationship with God. If you marry someone who has no relationship with Christ, their lack of faith and desire to serve Him will affect your relationship with God. You will be torn to love God, and love your spouse with their own selfish desires. While Solomon’s wives went after false gods, today’s non-Christians will go after false gods of a different type. Today’s non-Christian may go after wealth, popularity, power, and the Amerian dream. They may let their children become their idols, or their own physical appearance. Regardless of what it is that they bring into your life as a non-Christian, it will diminish your relationship with God if you aren’t strong enough to bear it. And the truth is, if you are strong enough to bear it, these things will prevent you from being attracted to that spouse, if not before you marry, then sadly during the marriage. When picking a mate, look beyond the hair, eyes, and skin. Look beyond their acts of love toward you. A strong marriage begins with strength of faith. God commands us to look for those that are of the same faith, so that we can be “equally yoked”. 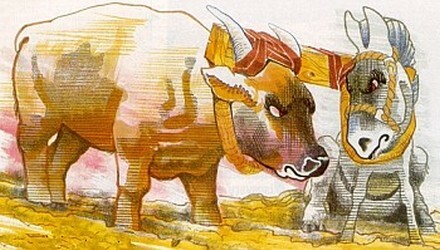 Not only do you not yoke an ox with a mule, but you don’t yoke an ox with a calf either. If their faith is not strong enough to be the head of the house, ladies, you may end up walking off path with them. If their faith is not as important to them as yours is to you, young men, you may end up feeling like your faith is a conflict because you cannot share it with her. Choose wisely, because “two become one” in flesh, and in spirit. WILL IT MAKE YOU OR BREAK YOU?